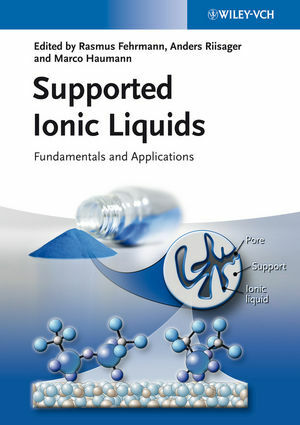 This unique book gives a timely overview about the fundamentals and applications of supported ionic liquids in modern organic synthesis. It introduces the concept and synthesis of SILP materials and presents important applications in the field of catalysis (e.g. hydroformylation, hydrogenation, coupling reactions, fine chemical synthesis) as well as energy technology and gas separation. Written by pioneers in the field, this book is an invaluable reference book for organic chemists in academia or industry. Rasmus Fehrmann is Professor and head of the Centre for Catalysis and Sustainable Chemistry at the Department of Chemistry, Technical University of Denmark (DTU). After obtaining his PhD from DTU he was awarded university candidate- and senior scholarships as well as postdoctoral fellowships at the Institute of Catalysis in Novosibirsk (Russia), Université de Provence (France), and University of Patras (Greece), before taking up his present appointment. His main scientific achievements fall within the chemistry of sulfuric acid catalysts, environmental catalysis and ionic liquid fundamentals and applications including SLP and SILP technologies. Professor Fehrmann has authored over 130 scientific publications, 20 patent applications, and 400 oral or poster presentations at international conferences, and has been a board member of the Danish National Committee for Chemistry for over a decade. Anders Riisager is Associate Professor at the Centre for Catalysis and Sustainable Chemistry at the Department of Chemistry, Technical University of Denmark (DTU). He studied Chemistry at the University of Copenhagen (Denmark) and obtained his PhD in catalysis from DTU in 2002. Subsequently he acquired a three-year postdoctoral fellowship at RWTH-Aachen/ University of Erlangen-Nuremberg (Germany) followed by a one-year Villum Kann Rasmussen postdoctoral fellowship at DTU, where he developed novel SILP catalysts and processes. He has authored more than 80 scientific publications and 20 patent applications, and received several honors including a nomination for the Degussa European Science-to-Business Award 2006 for SILP materials. His main scientific focus is the development of sustainable ionic liquid catalysis and separation technology. Marco Haumann has been a lecturer at the University of Erlangen-Nuremberg (FAU, Germany) since 2003. He studied Engineering and Chemistry at the universities of Dortmund and Berlin (Germany). After obtaining his PhD in 2001, he spent two years at the universities of Cape Town and Johannesburg (South Africa), developing novel catalysts in collaboration with Sasol Technology Pty Limited. From 2011 to the end of 2012, he was in charge of the establishment of the new FAU Branch Campus in Busan, South Korea. He has authored more than 40 scientific publications and was awarded the Arnold-Eucken prize of the Association of German Engineers (VDI-GVC) in 2011 for his contributions on SILP technology. His main scientific focus is the development of novel supported ionic liquid phase materials for catalysis and separation science.